After making chocolate chip cookies last week, I was thinking of doing something completely different this week. But. I remembered a recipe I’d bookmarked a while ago and I suddenly couldn’t get it out of my mind. 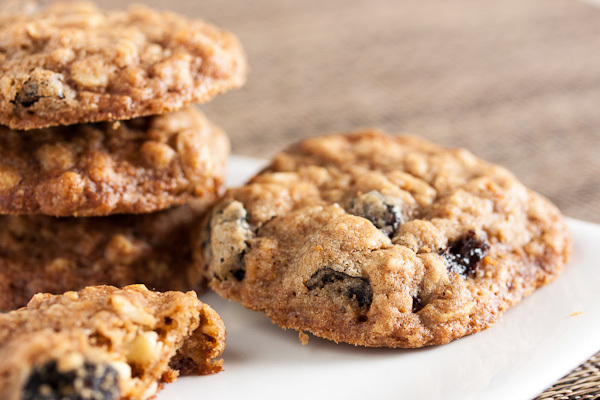 Yes, it has chocolate chips, but it’s not primarily a chocolate chip cookie. What really caught my eye was the dried cherries and candied orange peel. Does that count as completely different? Yup. Close enough. 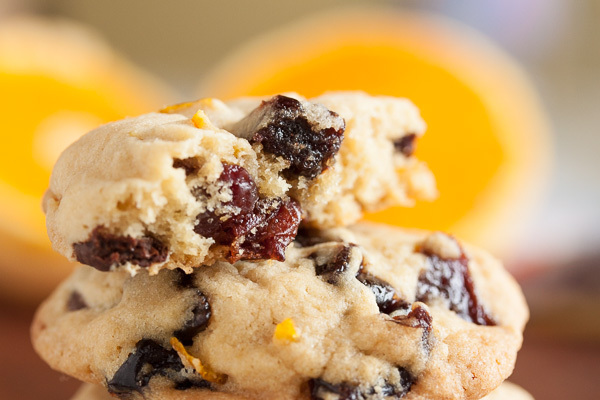 Of course, the thing that really attracted me to this cookie was the inclusion of candied orange peel. If you’ve been to this blog before, you’ll probably know that I loooove citrus. 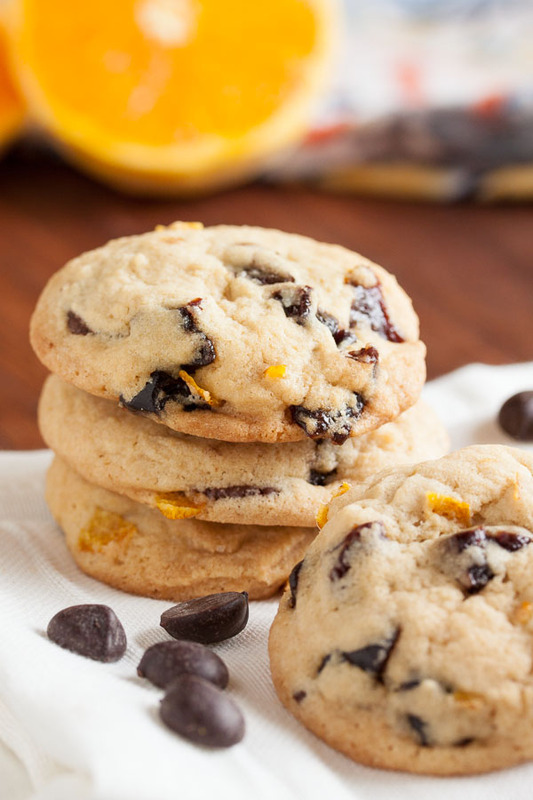 And the thought of tart cherries, orange and chocolate? Well that just sounded amazing, right? For this cookie, I had to plan ahead a bit – I already had all of the ingredients (you should see how many chocolate chips I keep in stock – it’s ridiculous!) except for the candied orange peel. But that’s not a big deal to make. I sound like I’ve made it a million times, right? I’ve made it once. I was expecting it to be a big undertaking that first time, but it’s seriously really easy to do. I just had to get some oranges and spend maybe an hour making it. I opted to make it the day before I made the cookies because it needs a bit of time to cool down. I used the peel from three oranges (coloured part only, not the full peel), and had enough for this recipe plus a little bit left over. Plus some delicious orange syrup that I’ll probably use up in cocktails. Or maybe over ice cream. Or maybe over a pound cake. So delicious, and so many options. 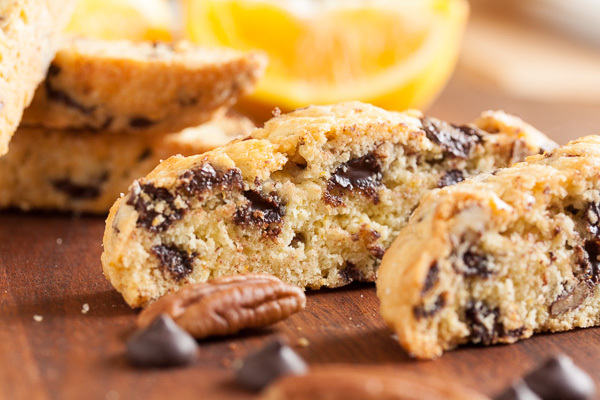 This cookie turns out amazingly soft, with great flavour from the orange, and the occasional burst of chocolate and cherry. The name of the original recipe is “cherry surprise cookies”, but honestly I think the orange is the prominent flavour here. That’s probably because when I made my orange peel, I used just the coloured part of the orange – so the flavour is stronger than if you use the entire peel. I could’ve used less peel, but regardless, I’m loving this cookie. And I’m hearing a lot of yummy noises from my coworkers. Adapted from "cherry surprise cookies" from Tracey Zabar's One Sweet Cookie, recipe by David Zabar. The recipe says it'll make about 30 cookies – unfortunately, I forgot to make note of how many I got (oops). 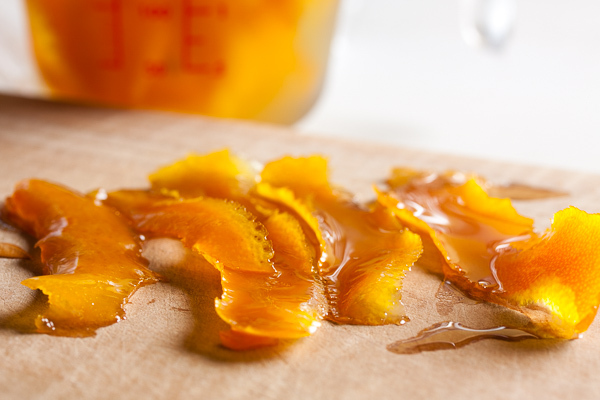 If you'd like to make your own orange peel, there's a recipe here. You'll need an hour to make it, plus at least an hour for it to cool before adding to the recipe. Coarsely chop the dried cherries and orange peel. Set aside. In the bowl of a stand mixer fitted with the paddle attachment, beat the butter and sugars together on medium speed until light and fluffy, about 3 or 4 minutes. Scrape down the sides of the bowl and add the egg, beating well. Add the vanilla and beat again to incorporate. Turn the mixer down to low and add the dry ingredients, mixing until just barely combined. 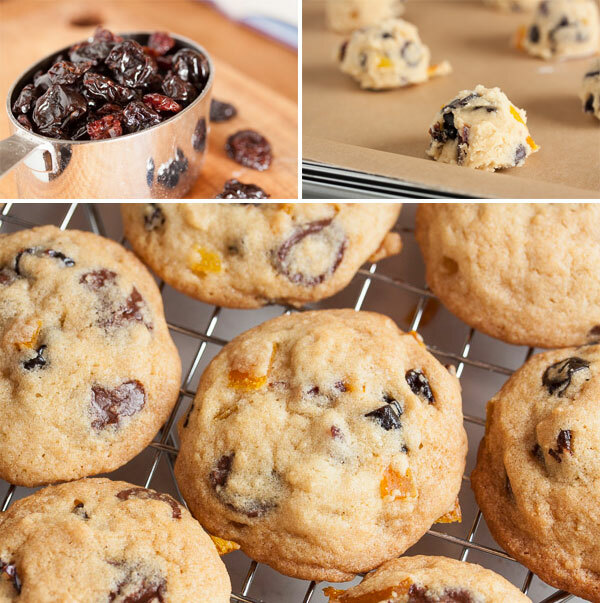 Remove from the mixer and add in the cherries, orange peel, and chocolate chips, either with a spatula or by hand. I prefer to knead inclusions in by hand to ensure they're distributed evenly. Yum! I just tested a recipe for orange sugar cookies for my blog. Great minds think alike 🙂 I love cherries and chocolate, so these sound incredible. Pinned to make before Thanksgiving!